Hiya superstars! I know that you are now an expert in handling text boxes and images, but there is more to learn. Let us get hard-core! Let us understand how to handle radio buttons, checkboxes, dropdowns, tables, alerts and much more but we will see one at a time. In this post, we will concentrate on handling radio buttons and checkboxes. At the end, you will be more expressive with WebDriver than you ever thought is possible. Radio Buttons: In a group of radio buttons, only one can be selected at a time. In HTML, they are represented using <input> tag with type attribute as ‘radio’. Checkboxes: In a group of checkboxes, each one operates individually and user can select multiple checkboxes as per the requirement. In HTML, checkbox is represented using <input> tag with type attribute as ‘checkbox’. 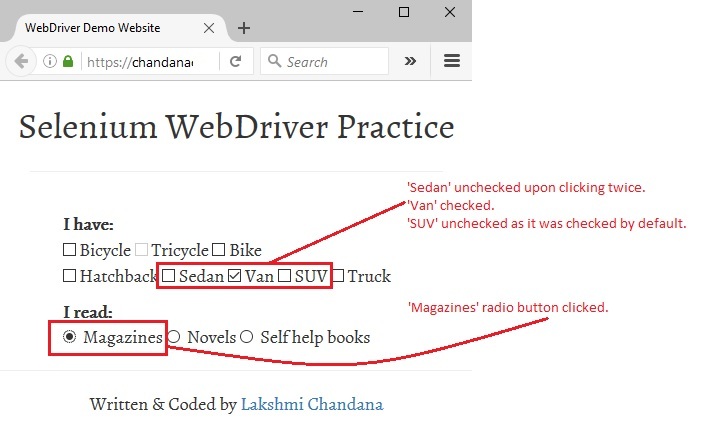 Now that we have some clarity on how radio buttons and checkboxes work, lets have some fun manipulating them using Selenium WebDriver. These five actions will be explained along with examples from our demo site. It doesn’t have the best UI in the world but it serves the purpose for now. Time to harness the power of locating strategies one more time! Example: Let us locate ‘Bicycle’ checkbox by id, ‘Tricycle’ checkbox by name, ‘Sedan’ checkbox by xPath and ‘Magazines’ radio button by cssSelector. With Selenium WebDriver, checking if a particular radio button or checkbox is displayed on the web page as expected, is a piece of cake! We have isDisplayed() method to our rescue. This method returns a boolean value (true – element is displayed and false – element is not displayed). Example: Let us check if the located ‘Tricycle’ checkbox is displayed on the web page. Similarly, in order to verify if a particular radio button or checkbox is enabled on not, we have isEnabled() method. This also returns a boolean value (true – element is enabled and false – element is disabled). Example: Let us check if the located ‘Tricycle’ checkbox is enabled. If yes, let us check it otherwise we will just print a message to the console. To verify if a particular radio button or checkbox is selected by defaulted, we have isSelected() method. This also returns a boolean value (true – element is selected and false – element is not selected). Example: Let us check if the located ‘Magazines’ radio button is selected by default. If yes, let us print that message to the console otherwise we will click on it to select Magazines option. Why do you think we have click() in Selenium WebDriver? You got me! It is that easy to select a radio button and in the case of checkboxes, same click() can be used to toggle between check and uncheck!! Example: Let us check and uncheck the ‘Sedan’ checkbox. System.out.println("Selection status of 'Sedan' checkbox: "
This code will check the ‘Sedan’ checkbox on the first iteration and then uncheck it on the second iteration. Selection status messages will be printed accordingly to the console. + list.get(i).getAttribute("value") + " selected? " Parts of the code are explained as part of each technique discussed in this post except for one snippet. All the checkbox elements in the list are verified if they have an attribute value that matches ‘Van’ and ‘SUV’. Their current selection status is printed to console as a message saying, BEFORE. Using isSelected() method, check if ‘Van’ or ‘SUV’ checkboxes are selected. Select the checkboxes if they are not selected and print its selection status to console saying AFTER. In case they are already selected, then deselect them by clicking again and print the corresponding message to console. Below image shows the Firefox output obtained upon successful execution of the test script. Time to experiment today’s skills. And yes, put on your safety helmets so that you don’t bump into any exceptions! See you in another post. Have a great day!